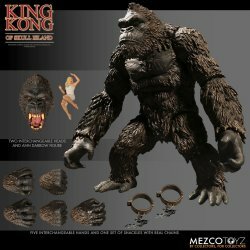 Mezco Toyz King Kong of Skull Island Action Figure Set - Color - JUST IN! 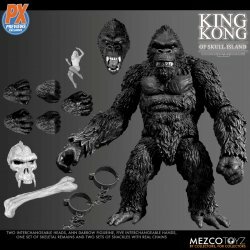 MyMovieMonsters.com > Action Figures And Busts > Mezco Toyz > Mezco Toyz King Kong of Skull Island Action Figure Set - Color - JUST IN! Mezco Toyz presents King Kong, the monstrous anthropoid that ruled Skull Island and terrorized New York in 1932. This is the full-color version as seen in the 2017 film. The King Kong of Skull Island figure stands approximately 7 inches tall, is designed with over 25 points of articulation, and includes interchangeable hands and head portraits. - King Kong of Skull Island is the perfect addition to any fine monster collection! Collectors Note: Brand-new and factory sealed Color Version. Picked directly from the manufacturer's shipping carton. Figure and accessories come packaged in a collector-friendly window box, perfect for display. We also offer the Previews Exclusive B&W version -- reminiscent of the 1933 classic film. Want both? Use the convenient Buy Both button below! Mezco Toyz King Kong of Skull Island Action Figure Set - PX Exclusive - JUST IN!